There are some things around the house that, if I had an extra pair of hands, they'd be done in, roughly, 30 minutes. What David and Carole are doing in the photo is one of those things. I have an antique bed set. It's a bed, dresser and dressing table. There's a bench that goes with the dressing table, but it needs to be reassembled with wood screws and glue and that is low on the list of things to do, mainly because I don't really have a place for the bench in the bedroom. 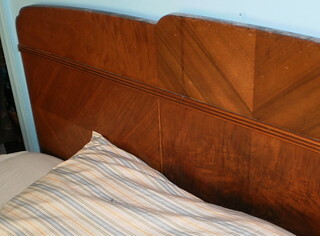 The bed consists of a headboard and footboard attached with wooden slats. There is a lip on the interior of the slats where pieces of wood lay crosswise to hold the mattress and box spring off the floor. Years ago, that lip on one of the slats cracked and broke off. I'm not skilled enough to fashion any thing that would replace this so I simply moved the mattress and box springs to the floor and have slept on them on the floor ever since. It's difficult to get up in the morning sometimes and back before my RA drugs, I needed a cane to lean on to stand up. I bought the cheap bed frame you see on the floor but it came when I was busy and then days stretched to weeks stretched to months and there was no way I could, physically, lift the mattress and box springs off the floor, assemble the frame and maneuver the mattress and springs down onto the new frame. When David and Carole came, it became one of those things that they could easily do in 30 minutes and we'd all sleep better. They discovered a small problem. The frame has no way to connect to my headboard or footboard. David could drill holes in each piece and, if I had the proper size wood screws, screw both pieces onto this frame. First of all, I knew I didn't have the right kind of screws. Secondly, while that's an adaptation to the new frame, it's not ideal and sort of ruins the pieces. David looked at the slats and said that because they are solid wood, we could go to the hardware store the next time he comes, buy some lumber and wood screws and he can fix the slats. Then the cheap-o bed frame becomes a give away item. So, the slats and the footboard went into the basement to await a time when they can be repaired and reassembled. The headboard is just leaning against the wall with the mattress shoved up against it. It's kind of noisy in that the mattress is not connected to it and rubs against it every time I roll over. It will take some getting used to, to sleep through the tossing and turning. 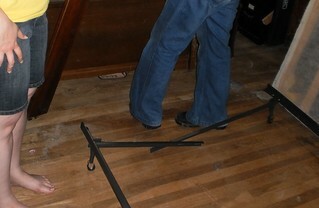 Elevating the mattress and springs about 4 inches off the floor has made a difference in getting up. It probably wouldn't have helped last fall as I was simply in too much pain. I was stiff on Monday morning but it was much less time consuming to stand up. I'm told there are bed elevating items I can get at Bed, Bath and Beyond which will raise the bed another 5 inches. That might be something to investigate but I'll need help in putting them on the feet. The cats aren't quite sure what to make of this new space to explore. I'm now going to have to remember that if I can't find it and it was in the bedroom, I should look under the bed.